In Malta you find Mellieha village surroundings with plenty of fortifications. Two of the most popular are Selmun Palace and even more the Red Tower. Selmun Castle is very much visible on your way to Mellieha from St. Paul’s Bay and surrounding areas, located at the top of a hill overlooks the Mistra valley. You can visit by car and park very close where you can enjoy it’s beauty and the views around jet it is closed for visitors. In the 1970’s it was incorporated with the Selmun Palace hotel Malta development but today the hotel is closed and up for sale. As with regards to its construction Selmun Palace although built 100 years after it is very similar to the Verdala Palace in Busketto. It is one of the few remaining buildings with a baroque style architecture. The type of design was an idea of a fortified palace firstly developed in Firenze and spread over to Italy and then across other European countries. It was the time when Corsears and Muslims used to come to Malta land and attach and burn what every they found. This is why they were designed as a fortified fort. 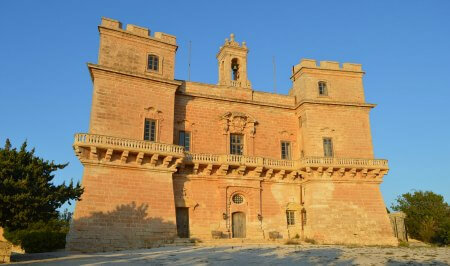 This palace was not built by the Knights of Malta as many may think. The then Caterina Vitale who died in 1619, who had a great wealth and large tracks of land at Selmun. She had written in her will that all her property and money is to be forwarded to the Monte di Redenzione which was a foundation collecting money from various people in order to pay the ransoms for the release of Christina slaves. Eventually the Monte di Redenzione built the Selmun Palace rented it to the Knights of Malta as a hunting lodgeto catch wild rabbits and as a place for complete relaxation since at the time there was no one living in the area except for farmers. Built purposely during the Knight of St John in 1648 during the reign of Grand Master Lascaris on a well planned location as to serve as a signalling tower to extensive further the coastal watch towers network. It communicated between Valletta and Gozo Citadel fortifications. It was purposely painted red as to be more visible even from Naxxar and the Mdina fortifications. This enabled the guards to identify the location of the tower and immediately understand any signals for action. 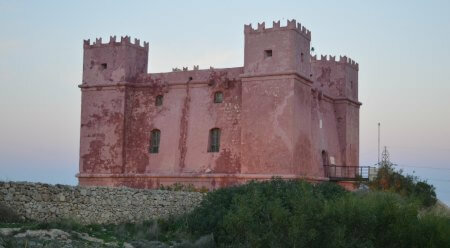 Due to the red colour it was commonly known as the la Torre Ross. Today it is referred to as the red tower or in Maltese as it-Torri l-Ahmar. It also had the capability of withstand a siege of 40 days with ample space for food provisions and ammunition for 30 to 40 men and cannons. The water was collected from the roof into a large cistern. During the British rule it was still used as part of the coastal defences. When the British services left the island in 1979 it was under the command of the Armed Forces of Malta and used as a radar station. Later it was abandoned and fell in disuse. During these last years it has been restored by Din l-Art Helwa a Maltese heritage association. It is open daily and manned by volunteers. They are very helpful and provide you with a lot of information to read making your visit more interesting.